It's great to see you here. It shows that you are really serious about improving your English. On this page you can upgrade your guide to the premium package for $2.99. High-quality Audiobook. Improve and practise your listening with the full audiobook. 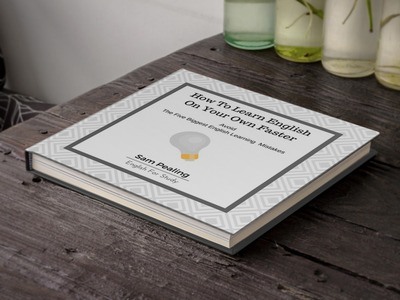 Use it to hear native my British pronunciation, listen and read along to learn the pronunciation of new words, and listen to it while you work. Quick Reference Cheat Sheet. Use this high-quality cheat sheet to quickly remind yourself of the mistakes you should avoid when learning English. Print it out and stick it on your wall to keep focused. Bonus Report: There are two more really common mistakes which I left out of the original guide (I wanted to keep the guide to 5 big mistakes). Anyway, you can find out what the sixth and seventh mistakes are in the bonus report. Yours to keep forever. These materials are yours to download and keep forever. Put them on your phone or mp3 player and take them with you. When you click the upgrade button, you'll be taken to a safe and secure page where you can pay using a credit or debit card or Paypal. After you pay, you will be able to download your premium materials. This is a ﻿﻿﻿﻿one time offer﻿﻿﻿﻿ & you will only be charged ﻿﻿once﻿﻿.